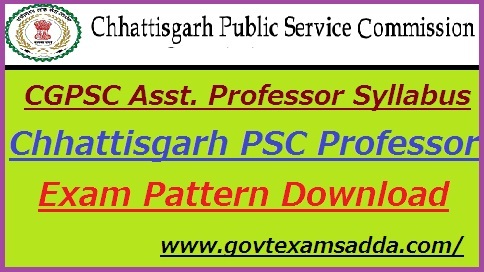 CGPSC Assistant Professor 2019 Exam Pattern:- Hello Applicants, The Chhattisgarh Public Service Commission has been announce the CGPSC Assistant Professor Syllabus 2019. If you are searching the Chhattisgarh Asst Professor Official Syllabus PDF, Then you are on right site. We have provide the CGPSC Asst Professor 2019 Exam Pattern PDF also. So you can check the complete info on this page. The CGPSC has upload the CG PSC Assistant Professor Syllabus 2019 for the aspirants. Applicants who have applied the CG Asst Professor Vacancy Form can download the CGPSC Assistant Professor Syllabus PDF. They can access the CGPSC Asst Professor 2019 Written Exam Syllabus through the link given on this page. The Chhattisgarh PSC announce a notification for the requirement of Higher Education Professor. Now the applicants are busy in the preparation of exam. They are required the CGPSC Exam Assistant Professor for the Exam preparation. In the below article, We have provide the Syllabus of Chhattisgarh Assistant Professor 2019. So applicants can check & access this. The Asst Professor Syllabus syllabus helps you in knowing the complete topics that are asked in the written exam. without knowing the CGPSC Assistant Professor Syllabus anyone can’t get good marks in the exam. Not only the Chhattisgarh PSC Asst Professor Syllabus PDF but knowing the Exam pattern also is compulsory to attempt the exam. The Exam pattern has the various Question paper structure. So, Contenders of CG Assistant Professor Exam need to follow the latest Exam Pattern. Written Exam (On-line) will be Objective Type Questions (MCQ). Exam Duration is 3 Hours (180 Minutes). There shall be Negative Marking of 1/3 on Each Wrong Answer. Minimum Qualifying marks will be 35% marks (for SC/ST/OBC 25% marks). History of Chhattisgarh and contributions of Chhattisgarh in freedom struggle. Geography, water, mineral resources, climate and physical conditions. Literature, music, dance, art and culture of Chhattisgarh. Tribals, dialects, teej and festivals of Chhattisgarh. Economy, forest and agriculture of Chhattisgarh. Administrative structure of Chhattisgarh, local government and Panchayati Raj. Human Resources and energy resources in Chhattisgarh. Education, health and contemporary events in Chhattisgarh. Candidates who are willing to prepare for the written exam and searching the best ideas can see here. We are giving the outstanding Preparation Tips for CGPSC Asst Professor Exam for the guidance of applicants. Complete all the high weightage concepts for the examination purpose. Give more priority for the important topics. During the exam preparation, Make the study notes. Revise complete important topic many times. Practice old question papers & model papers & attend the mock test also. Contenders are suggested to refer only official CGPSC Exam Pattern 2019, Because the Chhattisgarh Public Service Commission prepare the written exam paper from the CGPSC Assistant Professor Syllabus 2019 only. If you have any query than comment us.